The thing I absolutely adore about this skirt is the patchwork design (in colours that go so well with my hair) and the contrasting silvers buttons. Along with the high waist and A Line shape it really brings forward an interesting but timeless 70s vibe. Also, the button through skirt is definitely a must have piece at the moment. I really think this is a wardrobe item that can be worn for years to come. Below is my new favourite accessory. I have been looking for the perfect watch for a while, something with minimal features and a really big face and thanks to Instagram I found The Horse. 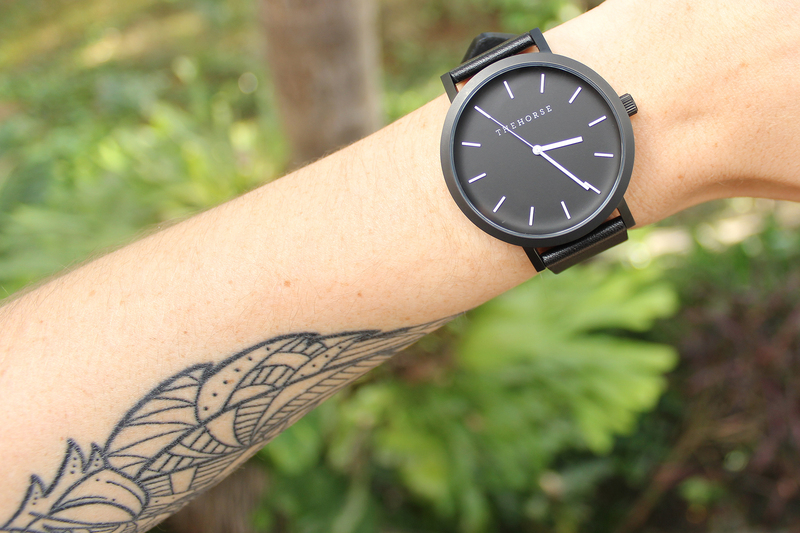 This matte black and leather band piece was exactly what I was looking for. Also, probably the most exciting thing that has happened recently is that I finally had my forearm tattoo done. I had a geometric style owl done around my pre-existing Deathly Hallows symbol, I have been wanting this done for years and completely love the outcome. I cannot wait to add more and more, I am planning on a full sleeve. Gosh, that skirt is absolutely gorgeous, and you styled it perfectly! This outfit is amazing! Definitely one of my favourites from your blog! I love button through skirts, and yours is really unique, love your outfit! 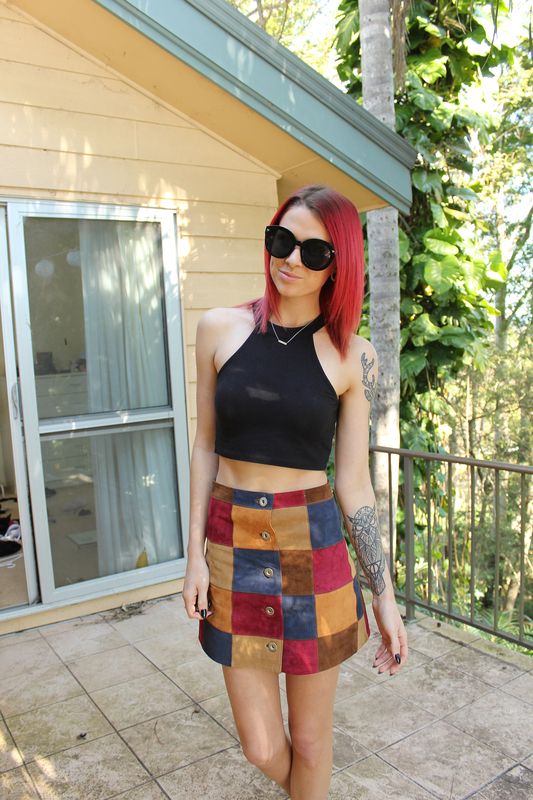 that patched skirt is amazing....and I love your tattoos. I need that skirt! I'm inlove with your photos. Btw, would you like for us to follow each other? Let me know. I am your newest follower. Keep in touch! 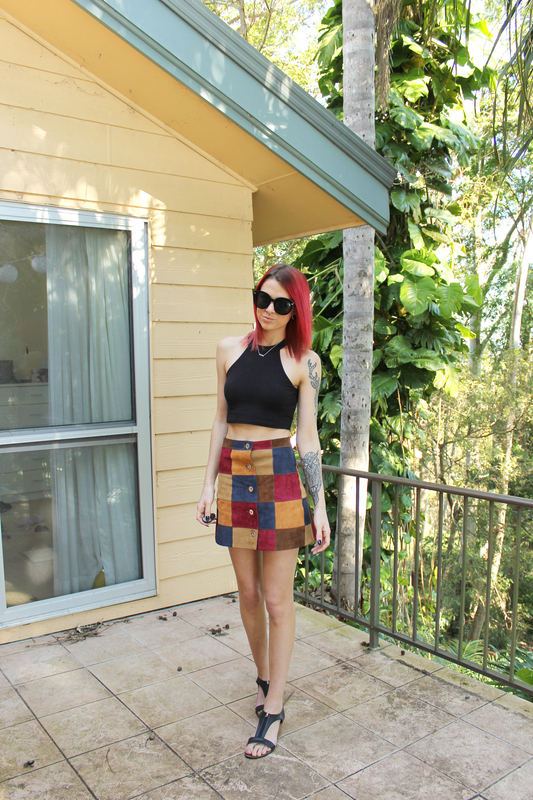 I am inlove with your Asos skirt! Goes perfect with your red hair! This skirt is beautiful !!! Love the hair colour ! Oh my gosh! What a great Asos find! I love the way you styled it. Such a cool skirt! I really love the patchwork detailing on it and I love the colors. Looks great with your crop top and watch. OMG!!! I Love your hair color! Love the patchwork design! The colours are great for fall too! love the skirt and love how you styled it . I love this outfit! It has a beautiful retro vibe. super cute outfit! i love the patch skirt so much. Love this outfit. I've been seeing this patchwork skirt on Asos and social media for a while now and I have to say it has taken my fancy but I don't think I'll wear it enough to justify the price. Love the tattoo as well, I really really love forearm tattoos. this is a tricky piece to wear but you did it outstandingly. fab style! Can we take a moment to appreciate 1. How amazing your figure is! (Like, hello hot stuff!) and 2. How gorgeous that skirt is! You look fab! Great skirt you look stunning. Gorgeous skirt!! Love your hair and tattoos. such a cool and chic look, I love suede! Let's follow each other on Bloglovin'! I love that skirt! Totally worth the money, as I'm sure you'll get plenty of use out of it and it's such a gorgeous, funky statement piece. It looks great on you. Gosh, love your style! followed you, maybe follow back? You look gorgeous. Such a lovely skirt; I love how unique it is! I have never seen anything like it before! Also, I love the classic watch! I want your skirt!! Beautiful look and thanks for the visit.Would you want to follow each other? let me know. Love your skirt :) Amazing look! You did well on deciding to get this skirt, it's amazing, and so beautiful on you! :D Love all the colours, it does indeed compliment you really well. Also love your new tattoo. Cool akirt and awesome look! Love your skirt, beautiful pattern! Omg this reminds me of Luanna's (from LeHappy) look! I love the skirt on both of you! Fantastic style! The skirt is amazing! Have a wonderful weekend! That skirt doe! It looks amazing. I love your style! Cute look darling, you're marvellous! This skirt is so stunning!! That skirt is so cool, I love it! Amazing look, skirt is gorgeous! Just found your blog and wanted to say I'm diggin all your looks! You rock! I love that skirt. You look amazing! You look absolutely stunning and I just love your tattoo. Great outfit girl. I usually see the brown normal suede skirt, not this one you're wearing. However, I think this skirt looks prettier ! This skirt is stunning and so unique! I love anything that colourful. I actually saw it on ASOS a little while ago and really wanted to buy it. That skirt is gorgeous, plus enviable legs much! 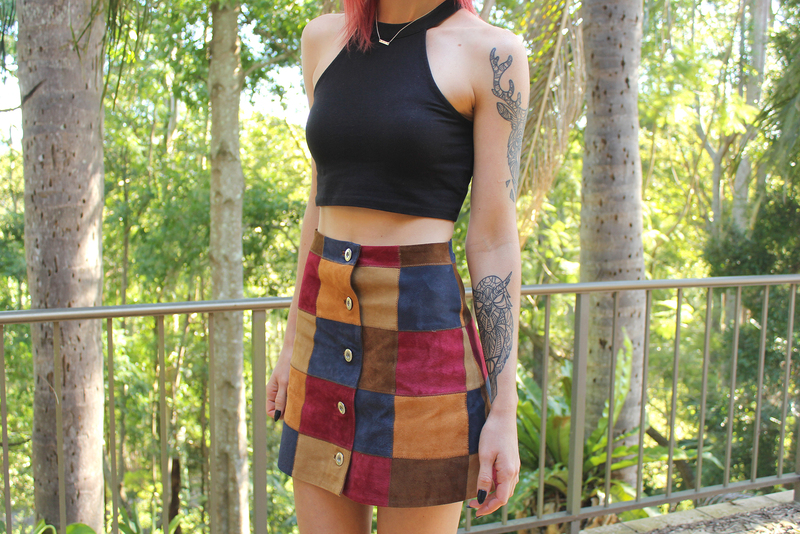 Such a unique skirt, loving your tattoos as well. You look amazing! Fun outfit! The skirt is unique and colorful! Skirt looks cute and your figure is just perfect. That patchwork skirt is so unique, I love it! Your tattoo is gorgeous, too - you'll look awesome with a full sleeve. Such a gorgeous skirt! I really love the details in your outfit as well, I especially like the watch! The skirt is so stylish, and I love your tattoo! The skirt is so cool! Love it with the cropped top and so in love with that watch! I'm dying for your skirt!! Love this outfit! You look amazing and that skirt is awesome! Love the skirt's colors and the watch! Been wanting to get a black watch like that. You look great in that patch work skirt girl! Love the look. This look is so rad! Gorgeous outfit! That patchwork skirt is beyond chic! SKIRT! <3 I must have it! You look beautiful and the skirt is so gorgeous!! Wow! I'm in love with that skirt, so beautiful! Rejoice the master creation of street style fashion at IndiaRush and get upto 44% off on them. Interesting blog about asos patchwork which attracted me more.Spend a worthful time.keep updating more. Lovely. The skirt is so pretty. I can go anywhere wearing those . Thanks for the style tips.